Anne C Witt is a Lecturer in Law at the University of Leicester. 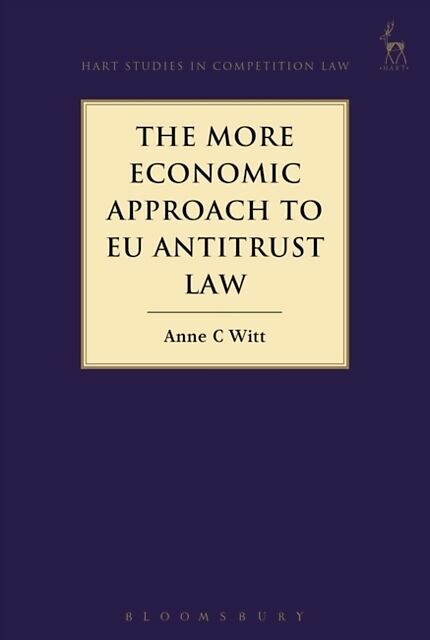 In the late 1990s, the European Commission embarked on a long process of introducing a 'more economic approach' to EU Antitrust law. One by one, it reviewed its approach to all three pillars of EU Antitrust Law, starting with Article 101 TFEU, moving on to EU merger control and concluding the process with Article 102 TFEU. Its aim was to make EU antitrust law more compatible with contemporary economic thinking. On the basis of an extensive empirical analysis of the Commission's main enforcement tools, this book establishes the changes that the more economic approach has made to the Commission's enforcement practice over the past fifteen years. It demonstrates that the more economic approach not only introduced modern economic assessment tools to the Commission's analyses, but fundamentally changed the Commission's interpretation of the law. Emulating one of the key credos of the US Antitrust Revolution thirty years earlier, the Commission reinterpreted the EU antitrust rules as aiming at the enhancement of economic consumer welfare only, and amended its understanding of key legal concepts accordingly. This book argues that the Commission's new understanding of the law has many benefits. Its key principles are logical, translate well into workable legal concepts and promise a great degree of accuracy. However, it also has a number of serious drawbacks as it stands. Most worryingly, its revised interpretation of the law is to large extents incompatible with the case law of the European Court of Justice, which has not been swayed by the exclusive consumer welfare aim. This situation is undesirable from the point of view of legal certainty and the rule of law.